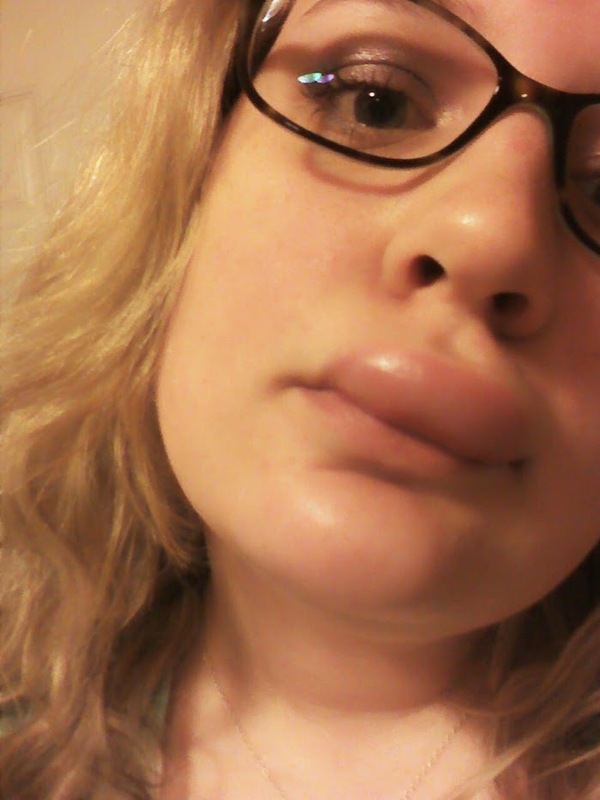 When I wrote the post telling about my struggles with auto-immune hives, I was in a very dark place. When re-reading it, I feel that I sound whiny and bitter. I'm okay with that though, because that is a very accurate representation of how I feel more often than not. When I wrote that post, I had no idea I would get such a wonderful response. I heard from complete strangers, people I hadn't spoken with in a long time, and some closer friends that didn't understand the extent of what I was experiencing. I received so many kind words of encouragement, wise words of wisdom, and valuable advice. To each person who took the time to message me, call me, pray for me, leave a comment, and to the hundreds that read the post, THANK YOU. I cannot express just how much it means to me. It feels so good to know that I am not alone and have a strong support of friends, family, acquaintances, and strangers. I'm grateful for the words I can re-read when it gets rough. Again, thank you. A lot has changed since my last post and I wanted to give an update. This is what my face looks like tonight, and I'm determined that it's for the last time. Again, please don't make fun. It's not easy to post this publically! And yes, it hurts! Last Thursday, Michael and I visited Dr. Buttler at Northwest Natural Medicine. We were both struck by his kind heart, encouragement, and ability to truly listen. Dr. Buttler spent over an hour with us, going over my symptoms and medical history. The next day I had blood work done, so he could get a better idea of what was happening. Today (Tuesday), we had a follow up appointment. I saw "we" because Michael is my teammate and my partner; he is experiencing this journey with me. Dr. Buttler made a copy of my lab results and went over each result with me. I've never ever had a doctor do that before! We spent over an hour going over the treatment plan he based on my symptoms and blood work. Dr. Buttler is all about treating the cause, not the symptom. He believes he can reverse my auto-immune disorder (I've actually met several patients of his that have done this successfully) over time, as well as the 6 other chronic conditions I suffer from. He is also confident that he can eventually wean me off all my medications and regulate my thyroid naturally. How is he going to do that, you ask? It's kind of a big deal, at least for me. The biggest change is going to be diet. Michael and I are going on a slightly modified form of the paleo diet. This means no sugar, legumes, grains, nuts, dairy, or nightshade vegetables (tomatoes, peppers, eggplant, potatoes). Basically I can eat meat, eggs, sweet potatoes, fats (such as oils and butter), and vegetables. A LOT of vegetables. This is going to be a huge transition for me, but I am so excited! Tonight I attended a paleo potluck through Dr. Buttler's office. We met many people who changed their lives through eating paleo, including one who had stopped the progression of cancer. There are some other treatments I will be doing that are unique to me. They sound a bit strange, but I was provided medical articles about each one and how they have been proven to help; even my skeptic self is convinced! I will now be taking a medley of vitamins and herbs, including B12, a genuine probiotic (meaning one that is refrigerated), and several others. I will also be doing hydrotherapy--after showering everyday, I need to turn the water to freezing cold for 30 seconds. This will help my blood circulate better, allowing my body to eliminate what it needs to without pushing out hives. Another thing I will be doing to help my blood circulate is to take a natural loofa and brush my dry skin. It sounds so weird! To improve my relaxation, I will take ten conscious deep breaths every hour. My body is incredibly stressed and is constantly in the fight or flight mode. This is a huge reason why it's hurting itself. Learning to relax and de-stress will help a great deal! In addition to these things, I will need to drink EIGHTY oz. of water a day, as well as walk outside for 30 minutes, rain or shine. I will need to be in bed with the lights out no later than 10 pm. I can't so much as look at an electronic device at least an hour before then. I will meet with Dr. Buttler once a week to check-in as well as work on my emotional health and stress levels. I love that he treats the WHOLE body, because it's all connected! This is going to be incredibly difficult, but both Michael and I are thrilled. We both truly believe that this is the absolute best decision for me right now, and are excited to see the improvements that come from our hard work. I've always been a skeptic about natural remedies but I am absolutely convinced this is best way to go for me. We both love Dr. Buttler and are very grateful to be working with him. He is a kind, genuine man that brightens both of our days! If you made it this far, please keep me in your thoughts and prayers. It's going to be a difficult transition, and it may get worse before it gets better. I am one who gets discouraged really easily and will need great strength to keep up with it. When I came back for our appointment today, I picked some tulips from our yard. I love spring and the sunshine and how everything is new again. 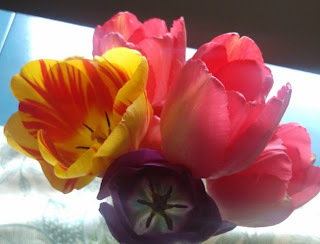 These tulips fought weeds and a cold winter, yet still came up as beautiful as ever. Cheesy, right? But I find that little metaphor hopeful and encouraging. So here is to a great tomorrow, the start of something new. Here is to a God that provides light in the darkest of days and hope for new beginnings. awww I love it girl! So excited for you. I saw you post something on FB about your appointment so thanks for updating the blog-was wondering how it went. Don't ya just love natural medicine! I love how it treats the whole body and is all about finding and treating the cause-not just the symptoms. Praying for good things for you girlie! Hang in there! Love you and your positive attitude...I'm so proud to be your mom!!! Praise the Lord for the answers you've received!!! This is great new, Allie!!! I'll be praying for you! And, like I said before - Honestly, if there's anything you need, don't hesitate to ask. wow- I am so impressed with your attitude about this, and your willingness to make changes to improve your health! I hope the changes will get easier over time for you!